YES WE WENT TO BOTH GAMES! AND THEY BOTH WON!!! 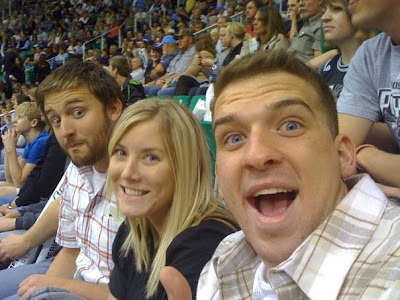 The Halls were so kind to give us 11th row tickets to the Jazz game against the Spurs! Chris has season tickets to the Ute's and hooked us up! I got to go up really close and take pictures, I just wish that Korver could have been taking some of those lay ups I forgot my camera so I had to take them with my phone :( It was an amazing night with Mike, Phil and Payden. I saw the Crexendo logo I tried to take a picture of it, but it didn't turn out. Crexendo is the company that I am under. I am 1 of 10 employees I think. I feel pretty special to be apart of it! OK back to the game. They won which was amazing, because they are having a bit of a rough start. AK-47 was the bomb as usual!